Spanx is the leading brand when it comes to body-controlling underwear. The design was formed for fashion conscious women, to create smooth silhouettes and seamless figures. Spanx underwear is created to accentuate the waistline, and BeigePlus have a huge range for you to choose from depending on your shape and areas you’d like to minimise. Spanx is available at BeigePlus up to size 28, giving you a choice of body-sculpting underwear to create a seamless figure to go with every outfit. Targeting stomach and thigh areas, Spanx ensures a perfect outline when wearing clothing such as body con dresses or clingy materials. Smooth your silhouette with Spanx shapewear! The revolutionary undergarment solution is loved by millions of women worldwide and no wonder - their ability to be comfortable and flattering is something other shapewear companies just can't compete with. Spanx shapewear is designed to be suitable for all body sizes and the company have introduced several different garments to cater to the requirements of different outfits. Whatever your size and shape, Spanx smooth your curves so you can feel confident and look amazing all day, every day! 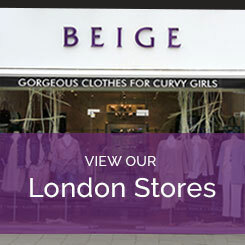 Beige is the only UK stockist of plus size Spanx shapewear up to size 3XL. If you would like more information please call a member of our friendly team who will be more than happy to help and advise you.